Claims United Nations Report Critical of Eritrea is Biased | .:TesfaNews:. It is said that Bryden may have been motivated by ulterior agendas, such as the recognition for Somaliland independence, which Ethiopia has been advancing at IGAD and the AU. Bryden’s conflict of interest in Somalia was raised by the Somali Permanent Representative at the UN and others. 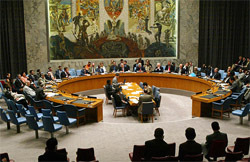 In a 2008 letter to the Security Council, he conveyed the TFG’s “strongest objection” to Bryden’s appointment as coordinator, but the Security Council chose to ignore it (because the US said he was not speaking on behalf of the TFG of Somalia) and eventually, the Somali representative was forced to withdraw his complaint. There were many others who questioned Bryden’s credibility and neutrality since. This entry was posted in News, Opinion and tagged Eritrea, Eritrea rejected SEMG report and its allegations, SEMG Report, SMEG Report on Eritrea are Biased, Somalia-Eritrea Monitoring Group, Un Report on Somalia and Eritrea, US-Ethiopia Engineered Sanction on Eritrea. Bookmark the permalink.